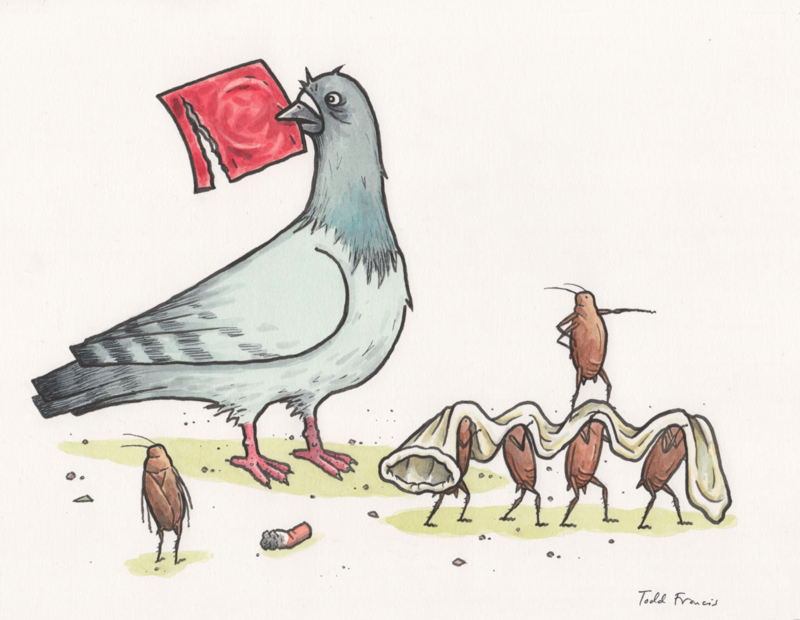 Porous Walker and Todd Francis present FOOLS, an art show highlighting the artists’ mutual love of irreverence, bad situations and bodily functions. Shown will be all new works never before seen by mankind, as well as a large collection of unique, signed and numbered products designed as gifts for the April Fools in your life. 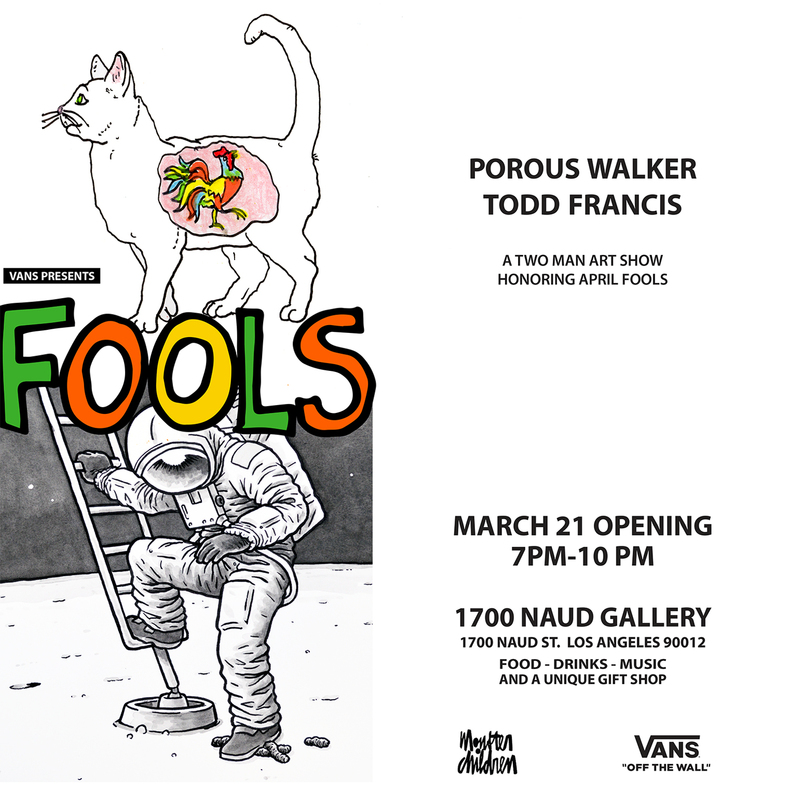 FOOLS launches with a March 21st opening at 1700 Naud in Los Angeles, an evening that will be filled with music, food, laughter and lamentation. The show will run until March 28th and is in partnership with Vans. Produced by the amazing Sarah Slaughter. I’ve got a solo show opening at La Jolla’s Misfit Gallery on November 17th, featuring all new studio work. The show runs from Nov 17th-Dec 19th, and i’ve also created a limited edition screenprint available through the gallery as well. 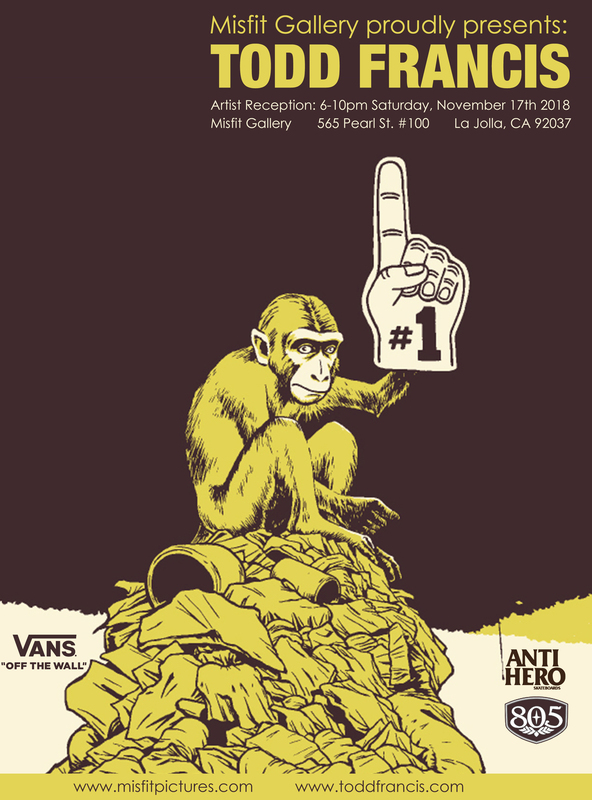 Sponsored by Antihero, Vans and 805 Beer, it should be a fun opening. “The Score” 20 x 16″ (plus frame) ink and watercolor on paper – a new painting shown as part of the “Bonkers” group show in Tokyo’s Wag Gallery. One of two new paintings available now, priced at $1300 + shipping, and sold/shipped framed. Email toddfrancisart@gmail.com for availability, paid via PayPal. 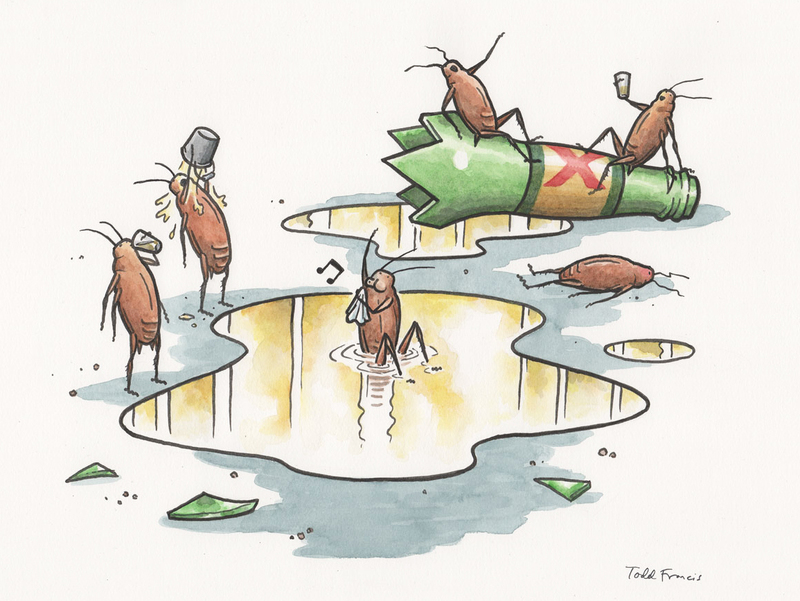 “Spill Party” 20 x 16″ (plus frame) ink and watercolor on paper – a new painting shown as part of the “Bonkers” group show in Tokyo’s Wag Gallery. One of two new paintings that are now available, priced at $1300 + shipping, and sold/shipped framed. Want it? Email toddfrancisart@gmail.com for availability. The August issue of Penthouse is out now, and inside you’ll find lots of butts. Here are the two with the most hair, seen front and center in my newest Fun Page. Get yourself a copy and fill your life with wisdom and pleasure. Out now from Antihero is the Evolution set, four pro decks built to endure even the hardest of looks. Decks for Trujillo, Hewitt, Raney and Russo, they seem to have a lot to say about this, that, and the other thing. In your local skateshop right now dammit. Its true, the December issue of Penthouse is out now, and inside you’ll find this Yule log, my latest Fun Page. 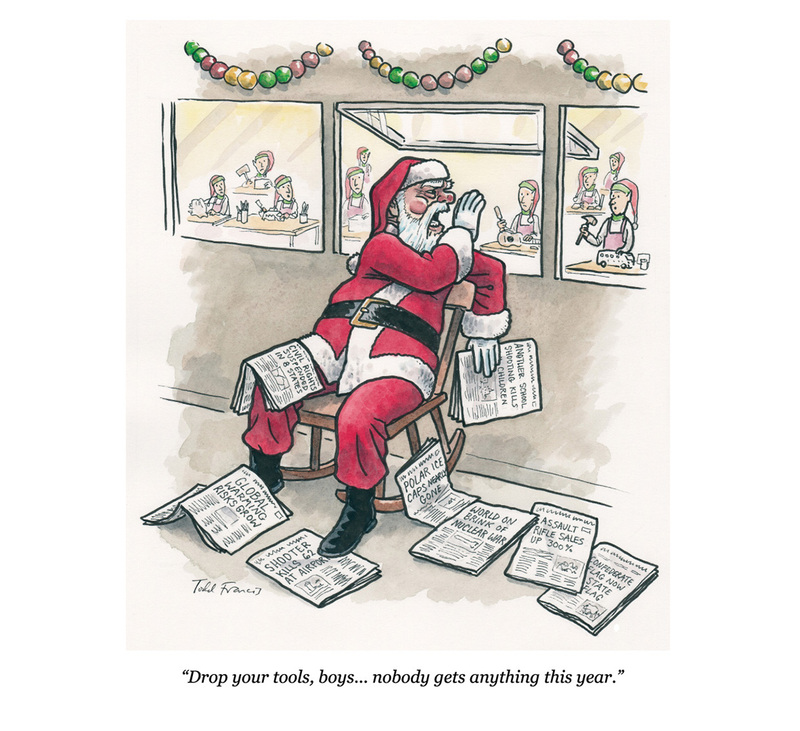 On newsstands now, get yourself a copy. Episode 4 of The Stance Podcast is out now, and they interviewed me about the craziest day in my life. I told a story from a long time ago, with the moral being: don’t do everything your boss says, especially when it involves ripping scary people off. 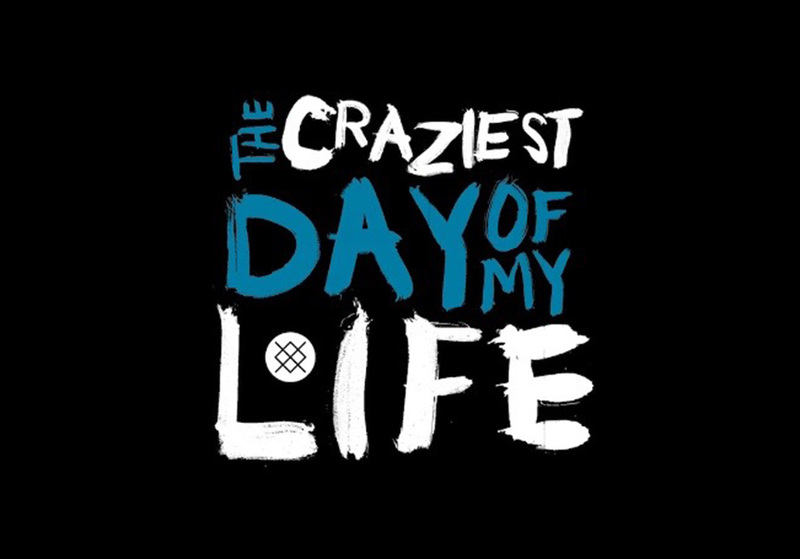 Hosted by Stance’s Erica Yary and Java Fernandez, give it a listen and learn from my mistakes.